A nurse caring for a patient. The definition of a nurse is someone who cares for sick, old or young people, or someone who provides medical assistance. An example of a nurse is a person who takes care of you while you are in the hospital. 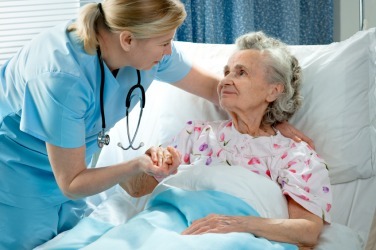 An example of a nurse is a healthcare worker at a retirement home. An example of a nurse is someone who helps care for a newborn baby in your home. To nurse is to care for someone or something, or to feed a baby milk from the breast, or when a baby drinks milk from the breast. An example of nurse is to help a bird with a hurt wing to heal. An example of nurse is to walk carefully on a hurt leg. An example of nurse is to wake up at night to feed your newborn baby. Nurse means to drink something slowly. An example of nurse is to hold on to the same beer all night. "nurse." YourDictionary, n.d. Web. 22 April 2019. <https://www.yourdictionary.com/NURSE>. a person or thing that nourishes, fosters, protects, etc. A person trained to provide medical care for the sick or disabled, especially one who is licensed and works in a hospital or physician's office. Zoology A worker ant or bee that feeds and cares for the colony's young. To serve as a nurse for: nursed the patient back to health. To cause or allow to take milk from the breast or teat: a mother nursing her baby; whales nursing their young. To try to cure by special care or treatment: nurse a cough with various remedies. To treat carefully, especially in order to prevent pain: He nursed his injured knee by shifting his weight to the other leg. To manage or guide carefully; look after with care; foster: nursed her business through the depression. See Synonyms at nurture. To bear privately in the mind: nursing a grudge. To consume slowly, especially in order to conserve: nursed one drink all evening. To serve as a nurse. Middle English norice, nurse wet nurse from Old French norrice from Vulgar Latin nutrīcia from Late Latin nūtrīcia from feminine of Latin nūtrīcius that suckles from nūtrīx nūtrīc- wet nurse ; see (s)nāu- in Indo-European roots. A person (usually a woman) who takes care of other people's young. In sense “to drink slowly", generally negative and particularly used for someone at a bar, suggesting they either cannot afford to buy another drink or are too miserly to do so. By contrast, sip is more neutral. Variant form of the archaic nourice, from Old French norrice, from Latin nutricius (“that nourishes"), from nutrix (“wet nurse"), from nutrire (“to suckle"). A person employed to take care of a young child. A woman employed to suckle children other than her own; a wet nurse. To cause or allow to take milk from the breast or teat. To treat carefully, especially in order to prevent pain: nursed an injury.